Inflammation can present itself in a variety of ways. For some people it creates muscle soreness, pain, a burning sensation or even an itchy feeling. It can also be accompanied by other symptoms such as tightness and swelling in the skin. What is interesting about inflammation is that we need it to stimulate the healing process when something goes wrong within the body; however, too much inflammation can end up creating a lot of discomfort, as well as a variety of health complications. When we cut ourselves, it may get red, swollen and perhaps puffy. The area becomes inflamed due to an important chemical reaction that takes place to break down damaged tissue, fight off germs, and heal the wound. You could call inflammation our body’s self-healing system. Unfortunately, in some people inflammation is in the body more than it should be. Chronic inflammation has been associated with diseases such as arthritis and tendonitis. Studies have also linked inflammation to heart disease, brain ailments, diabetes, cancers, allergies, various auto-immune diseases, and sinus problems. 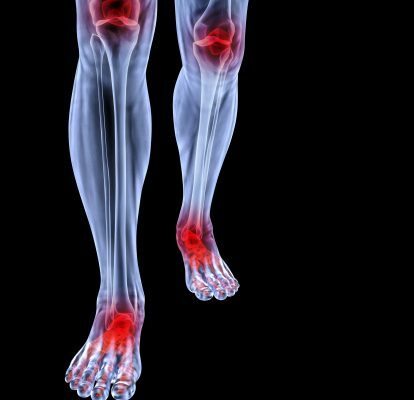 If you are experiencing muscle soreness, pain, burning or other symptoms associated with inflammation, or if you suspect you have a problem with your joint health you may want to look at some of the root causes. Close to 50 thousand Americans have some form of arthritis. The chances of getting it increase with age; however many young people also suffer the muscle soreness, pain, and stiffness associated with this crippling ailment. The most common form of arthritis is osteoarthritis. It occurs when cartilage on the bones wear down. Arthritis can impact your joint health due to age, weight, injury, illness and infection. There are over 100 different types of arthritis. Evidence continues to connect diet and lifestyle to inflammation and problems associated with it. Boston’s Brigham and Women’s hospital has conducted studies that show inflammation is a “central” factor in cardiovascular disease. Experts at the Cleveland Clinic say inflammation and heart disease are no longer a theory, but a reality. Of course a poor diet is one of the biggest reasons people end up fighting heart disease. Fatty build-ups in the muscles become inflamed. Inflammation can be measured with a test called the C-reactive protein check. Research indicates that diet and exercise can significantly lower C-reactive protein or CRP. Several U.S based studies, including research at Oregon State University, show that high glucose levels lead to inflammation as well. Just as some foods can lead to inflammation; other foods such as grapes, blueberries and cranberries have been known to help reduce inflammation. Disease causing organisms can invade various body parts internal and external. Infections tend to include inflammation. Examples include everything from strep throat and influenza, to Hepatitis and Aids, to gingivitis and foot fungus. The Centers for Disease Control notes that there is long medical history of linking infections with inflammation, and inflammation with chronic disease. Researchers at the University of San Francisco and the University of California say people who experience a lot of stress have higher inflammatory markers in their bloodstream. Other studies have looked at the relationship between stress and inflammation, but this is the first time a study has taken a close look at the impact of cumulative stress and inflammation. The two universities examined close to one thousand with stable heart disease and analyzed their exposure to at least 18 different stressful events. They measured clinical markers of inflammation that circulate in the bloodstream and found a direct link between lifetime stress and inflammation.